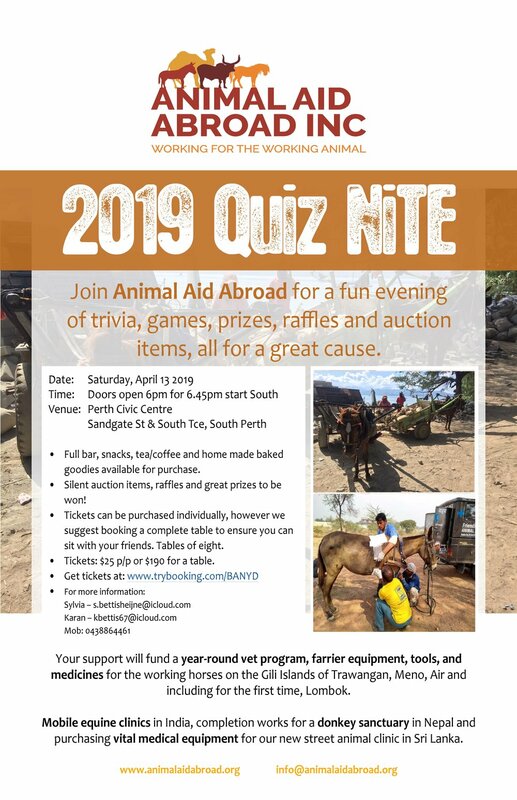 Join Animal Aid Abroad for a fun evening of trivia, games, prizes, raffles and auction items, all for a great cause! Your support will fund a year-round vet program, farrier equipment, tools and medicines for the working horses on the Gilli Islands of Trawangan, Meno, Air and including for the first time, Lombok. Mobile equine clinics in India, completion works for a donkey sanctuary in Nepal and purchasing vital medical equipment for our new street animal clinic in Sri Lanka. Full bar, snacks, tea/coffee and home made baked goodies available for purchase. Silent auction items, raffles and great prizes to be won! Tickets can be purchased individually, however we suggest booking a complete table to ensure you can sit with your friends. Tables of eight. Tickets $25 per person or $190 for a table of eight.